The stage in Buffalo State's new Ciminelli Recital Hall at Rockwell Hall symbolizes one couple's passion for music and affinity for Buffalo State. Joan Steinmiller Richmond, '45, and her husband, George E. Richmond (pictured), reveled in the arts, especially music. Throughout almost 60 years of marriage, the Richmonds attended numerous musical and theatrical performances spanning the Chautauqua Institution to the Stratford Festival. They served on the Amherst Symphony's Friends Committee. Joan also served as a vice president and director of the Amherst Symphony Board and as a board member of Young Audiences of Western New York. "I guess you could say we were big patrons of the arts," George Richmond said. Throughout the years, the Richmonds also shared their time and resources with Buffalo State, including serving on the alumni committee to build the new Burchfield Penney Art Center. To honor his beloved wife, who passed away on September 10, 2010, Richmond made a generous gift to the Music Department as part of the fundraising initiative Transforming Lives: A Campaign for Buffalo State. His gift will create scholarships for deserving students in years to come. 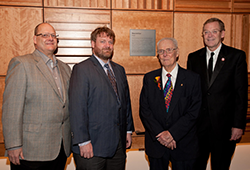 In recognition of his gift for this special alumna, Buffalo State named the stage in the state-of-the-art recital hall the Steinmiller Stage. "It was an opportunity to make a difference," Richmond said. "Even though I didn't attend Buffalo State, I still have a great affinity for Buffalo State." At what was then State Teacher's College, Joan Richmond Steinmiller became a star student, according to her husband. She was named the White Rose Queen, was an active member of Alpha Sigma Alpha sorority, and earned the Bishop Honor Award for Outstanding Senior Girl in 1945. After graduation, she earned a master's degree in education from the University at Buffalo while simultaneously teaching second grade at School 18 in Amherst. She returned to Buffalo State in 1950 as an assistant professor of education. In this role, she taught sixth grade in the college's School of Practice, which served as a teaching lab for education students. She later taught at the Park School, Christ the King, and Amherst Adult School. In 1951 she married Richmond, a World War II Navy veteran. He earned his bachelor's degree in engineering that same year from the University at Buffalo and worked as a computer scientist and engineer, primarily at the Calspan Corporation. The couple had six children. George Richmond joined his wife, Joan, on December 6, 2013.  The Richmond's legacy to Buffalo State and its impact on students will be felt in perpetuity.